T he Blue Water Trolley, Michigan’s finest tourist value, is brought to you by Blue Water Area Transit and local area merchants. 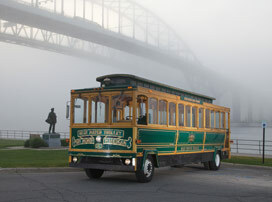 The trolley tours the beautiful Blue Water Area, where two countries, U.S.A. and Canada, come together across the St. Clair River. The one hour tour, which includes a swing by various local points of interest, takes you through the heart of Port Huron and along the river front for a panoramic glimpse of the Blue Water Bridges, the Thomas Edison Statue and Depot. The starting point for each run is downtown at 331 Huron Avenue on the hour, every hour beginning at 12 noon. The last tour departs at 4pm. You can also catch the trolley at the Blue Water Transit Bus Center transfer point, where other system buses interconnect, and at other designated stops shown on the Tour Map. Trolley Fares in 2018 are still just 10 cents per person. 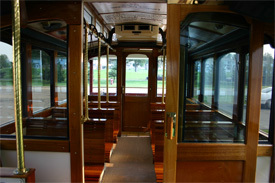 The fare for Senior Citizens (60 and up) and persons with valid Medicare cards and handicapped is 5 cents. 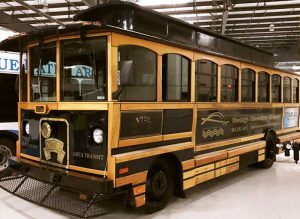 For an additional fare, the trolley also interconnects with Port Huron’s city-wide transit system which serves all major shopping and industrial centers in the area. The one hour tour, which includes a swing by various local points of interest, takes you through the heart of Port Huron and along the river front for a panoramic glimpse of the Blue Water Bridges, the Thomas Edison Statue and Depot. The starting point for each run is downtown at 331 Huron Avenue. 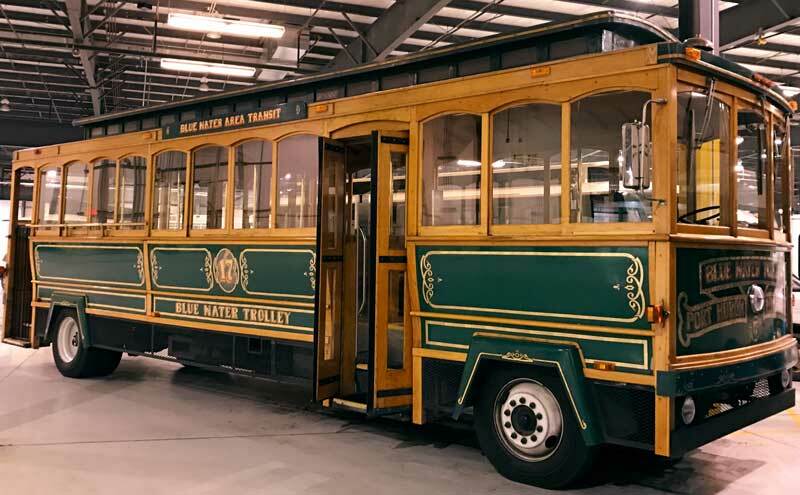 You can also catch the trolley at Blue Water Area Transit’s Quay Street transfer point, where other system buses interconnect, and at other designated stops shown on the Tour Map.